I owed you quick post to share some of our art finds from our Rio de Janeiro trip last month. When we go on vacation, we like to bring back some art that will forever remind us of our trip. Some people buy shot glasses...and we buy flea market art! Go figure. Of course, we couldn't decide on just one piece of art, so we'll have a spattering of Rio artwork throughout the house. First off, we have the "spatula" piece depicting the favelas of Rio - the artist used a small spatula to cake on a thick layer of white acrylic then scraped it off, revealing the rooftops, windows, and doorways. He then painted over it with (lovely!) vibrant colors. 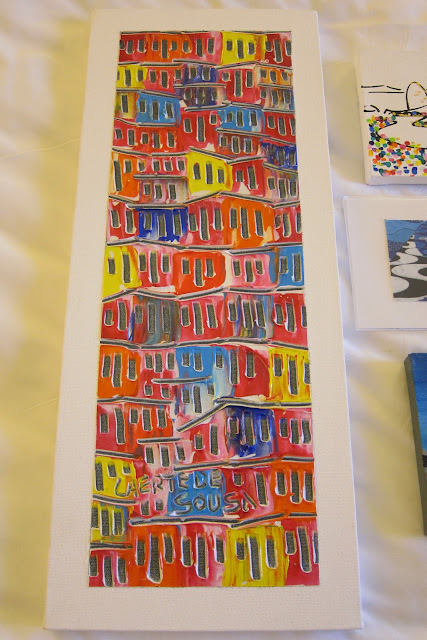 Next, we have a mini abstract of the bay that sits at the base of Sugar Loaf mountain. I love the multi-colored dots, square-ness, and simplicity of this piece. And, this little palm tree print was too cute to pass up for $2.50. Again, it has the Copacabana sidewalk wave goin' on. Finally, we have our "yellow" oil painting that shows the Christ the Redeemer Statue in the foreground and Sugar Loaf mountain in the background. 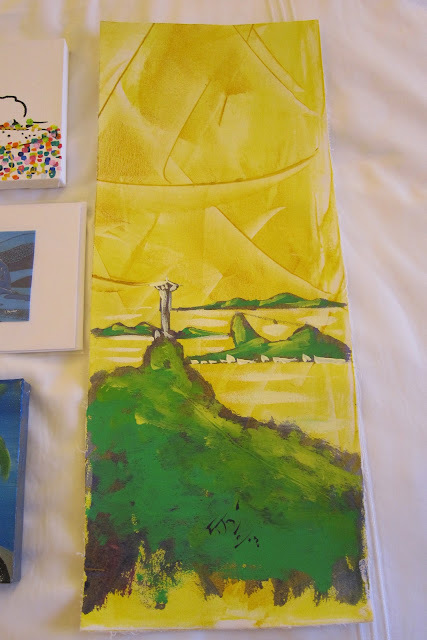 I can't say no to yellow, and we loved how this painting vividly shows how amazingly lush and green it was in Rio. There they are...happily sitting on a sheet before being hung (or propped up) throughout our home. Anyone else like to find local art while on vacation? Which of our paintings is your favorite? Which would you have opted to take home with you? The first two are my faves and they're awesome. I have some street art from Italy. I think art is a genius idea to bring reminders of your trip home. We don't typically buy art, but I always try to find a unique decorator item. A vase, a basket, etc. I can totally see why you were drawn to these pieces. The color captures the locale so perfectly. What great souvenirs! Been to Brazil several times, so I've seen these in person. As much as I love the Christ picture, the one that really gets me is the houses on a hill. Had I seen it I would have bought it! Actually, I would love all of them! !